Hi everyone, can't believe it's been a couple of weeks since I wrote anything - I knew it was a few days, but gosh time flies! I'm not sure why I've been so busy actually - nothing in particular, just everyday life in the shop. We have taken delivery of most of our Spring / Summer clothes now and the shop is looking really pretty. Lots of delicate prints and subtle pinks and blues. I will try and remember to bring my camera in to take some snaps. 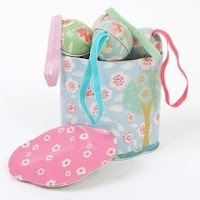 Am awaiting my Easter order from Maileg which will contain lots of new bunnies and a few pretty home accessories, like the storage tin pictured. Glad you're OK, I was getting worried! That tin and the little eggs look gorgeous. I bet your shop is looking fab. I know what it's like ~ blogging is a luxury when your are busy with a business! Speaking of which, are you going to get some of the little egg shaped Maileg tins with bunnies on? I saw them on the Maileg website and I really want a couple for easter but can't find them in the UK! If you do ~ will you have them on your website?